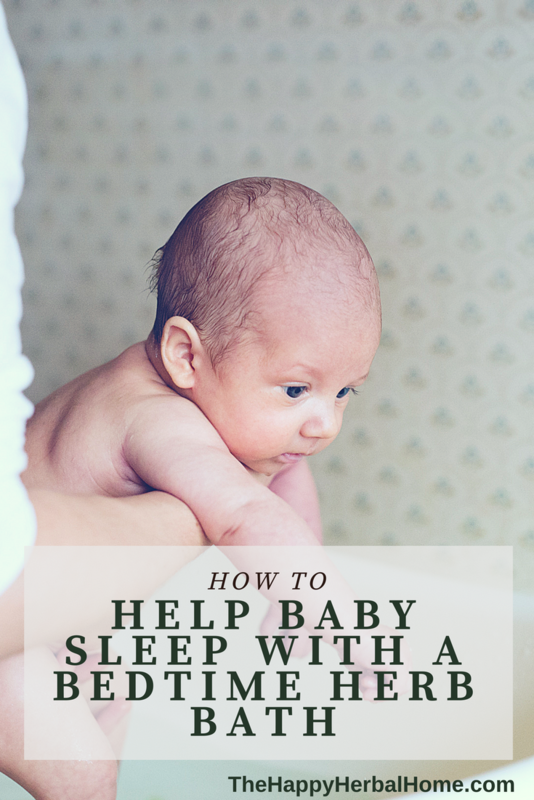 Taking care of a baby who isn’t a good sleeper (my first one was not!) is super tough, then sprinkling in your own sleep deprivation… can make it unbearable. 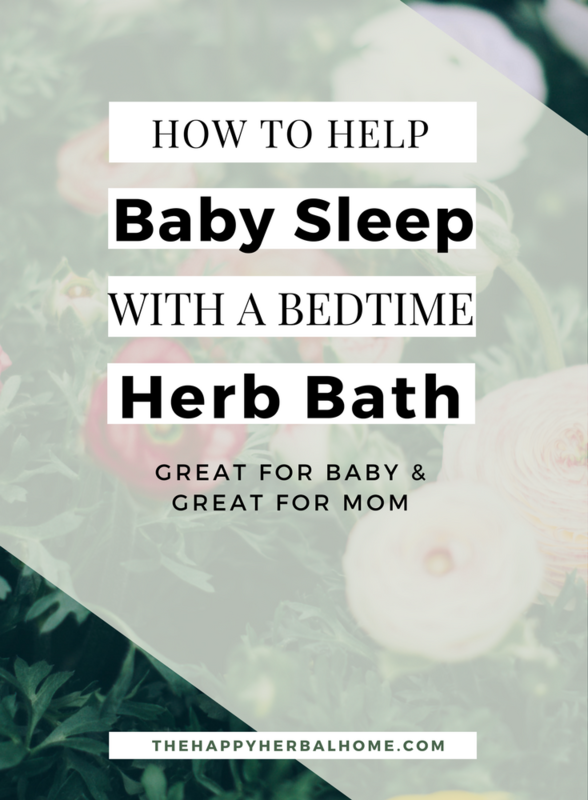 One trick we use in our house for better baby sleep is an herbal baby bath. An herbal bath like this can soothe, calm and relax the both of you and may be just what you need. It’s a calming element that’s perfect to add to your babies bedtime routine that helps baby (and mama) welcome sleep. 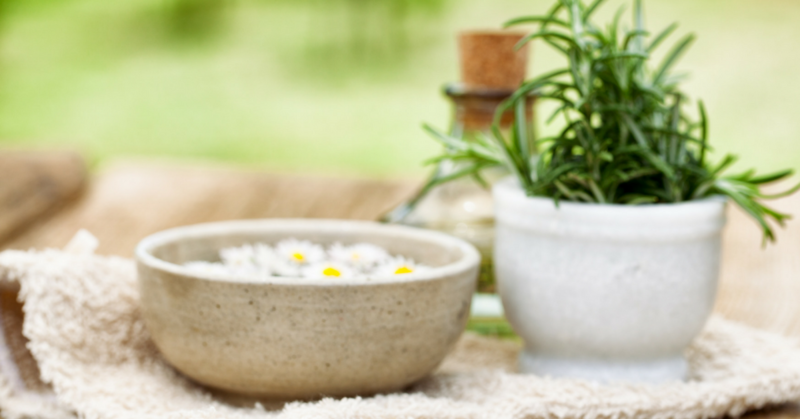 An herb bath helps to clean baby without using soaps that can be too harsh on their delicate skin. Soap should be avoided as much as possible those first few weeks to let the good bacteria (aka the skin biome) develop properly. The herbs will also help they can help soothe their skin and calm restless nerves. 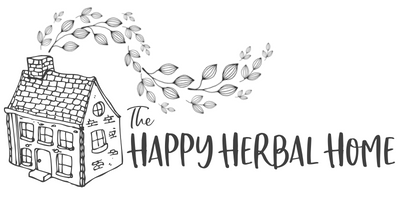 Your herb bath can be a specialty mixture taken straight from the garden, created especially for baby from your dried herb stash, or if you don’t use herbs very often you can get a premade mix. You can get your own pre-made mix from a variety of places. You can get a great mix of calming herbs in this herbal baby bath mix formulated specifically to help calm a baby. These are all perfect to help those little baby skin problems that newborns seem to get. Mine both had some sort of combination of baby acne, random rashes, cradle cap and my second had the worst diaper rash due to his super sensitive skin. He got herb baths on the regular, and they helped him calm down and soothe his skin. To make your mix just use equal parts of whichever herbs you prefer or have on hand and store in a dark container or paper bag. Why Use Loose Leaf Herbs? If you’ve never bought loose leaf herbs to keep in the house before, you’re in for a treat. It may sound weird if you didn’t grow up using herbs, but bear with me. When I first became a mom, I realized I needed to clean up my act. I didn’t want my baby to suffer from all the chronic disease that everyone around me was struggling with. Many of which are preventable. My first choice of action was a healthy diet, and the second was getting started using herbs. It was one of the best choices I ever made! The great thing is if you buy these herbs as loose leaf herbs, you can start building up your own little herb stash to use for all sorts of quick remedies. You can buy some of these basics like the ones above for your baby bath, and then find other ways to use them. One of the best ways to learn about herbs is by using them! I really like Starwest Botanicals to purchase herbs. Since they are dedicated to just serving dried herbs, they ensure everything is cared for properly and that your herbs stay fresh until delivery. You can put the bath mix into a reusable muslin bag and just drop it in the water. However, when I did this I felt like the water didn’t get hot enough to extract all the goodness out of the herbs. To counter this, I just filled up the baby bath with really hot water and tossed in the tea bag. Then I let the bath cool down enough before adding baby. If that’s not easy enough for you there’s always my go-to method. This is the easiest and quickest way, although not as many healing benefits because it uses only a couple herbs. Every night after dinner I make a big pot of chamomile and lavender tea for everyone. It eases digestion and helps everyone wind down for the night. I make enough tea to have leftovers and add more hot water and rebrew whatever is still in there. I simply pour that in my baby’s bath. 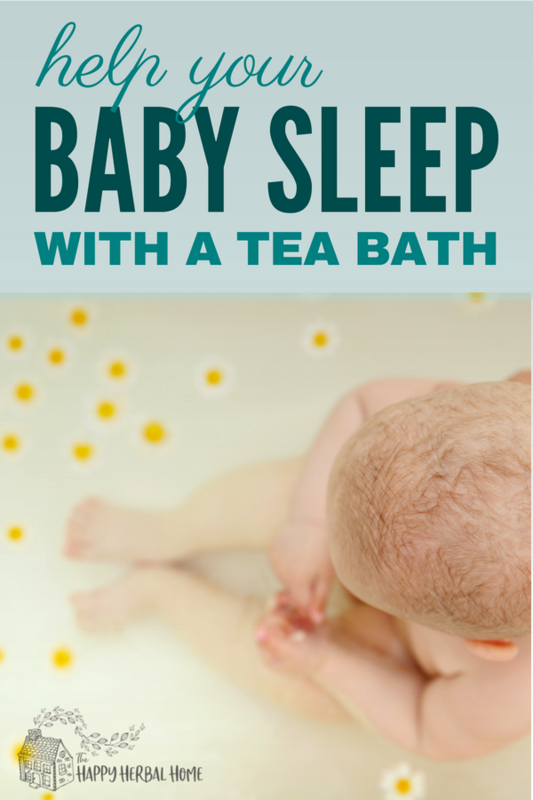 Just make sure to add the herbal tea to the bath before putting in your baby. And there we go, a simple chamomile and lavender bath to help baby sleep a little better. This is my personal favorite way because there is no waste of herbs, it barely takes a couple of minutes, and no extra mess to deal with. I definitely prefer loose leaf tea. (You can read why you should too here.) But if you’re more of a tea bag kinda gal I suggest this brand. It’s the only brand of herbal tea I buy. Its all organic, and the safest brand I’ve found. Always watch for allergies, I personally have never had a problem with skin irritation for my baby with any of these herbs, but it can happen. When using hot water to brew your bath, make sure to always check that the water is cool enough for baby. What feels warm to us can feel too hot for baby. And just as a little public service announcement, NEVER leave baby unattended in or near any water, not even for a “second.” Drowning is the number one cause of death in children under 6! Always follow the ABCDs of water safety.